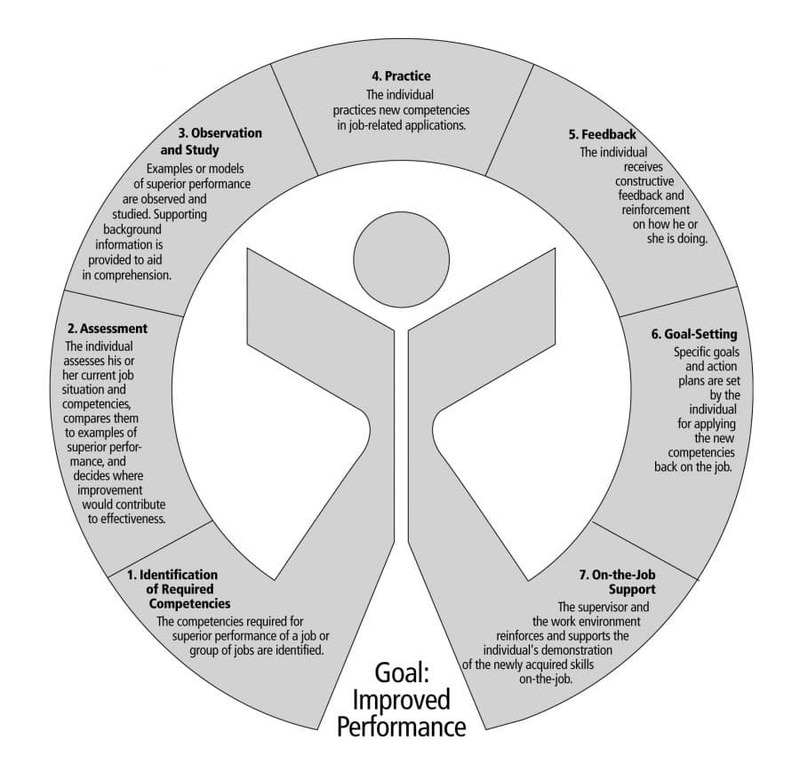 Competency modeling provides a truly ideal framework for your training programs. Studies show that competency-based training offers a return on investment (ROI) nearly ten times higher than the ROI of traditional training methods. Workitect has developed a process entitled the Competency Acquisition Process (CAP) for managing training efforts through increasing levels of competencies. The CAP consists of seven steps, outlined below. Identification of Required Competencies: Job Competency Models supply this information, or a simpler, less detailed system can be used for non-critical jobs. Assessment: Employees assess their current competencies and compare them to examples of superior performance. Performance assessments by managers are obvious tools as well. Employees and managers then decide which skills to focus on. Observation and Study: Employees study examples or models of superior performance. Trainers provide supporting information to aid participants’ comprehension. Practice: After acquiring a basic understanding of the concepts involved, participants move to practical, job-related applications of their new knowledge. Feedback: Trainers observe participants applying their new knowledge and offer constructive feedback and reinforcement. Goal-Setting: Trainers work with employees to set specific goals and action plans for applying new competencies back on the job. On-the-Job-Support: Supervisor and peers reinforce and support each individual’s demonstration of newly acquired skills. When your employees enter this cyclical process of planning their own development and acquiring necessary training, everyone benefits. They take responsibility for their own career paths, their own job security, and you gain an ever more skilled and competent workforce. Improved performance, bonuses, increased productivity, and career advancement spell success for everyone. Workitect’s Competency Development Guide includes details on how you can use this process to develop thirty-five competencies. To learn more about how you can implement the CAP process within your organization, please contact us via e-mail or phone.